Ever wonder what our Chinese neighbors are up to? Take a look at this report that summarizes a recent survey to find out Chinese developer trends and interests. As the Stack Overflow Developer Survey 2018 and GitLab's 2018 Global Developer are making headlines on the web, developers from around the globe are getting a better view of the various trends and practices in software development. Although these reports are informative, they do not accurately reflect the current state of software development within Mainland China. In response to this information gap, the Alibaba Cloud Developer Community published its very own annual China Developer Survey Report in December 2017. This study featured over 7,000 developers across China and from various industries answering 118 questions. Through the survey, developers shared their perceptions on several topics, including development environment, development language, programming environment, database, integration management tools, and API capacity preference. They also communicated their understanding and practices in multiple technical fields such as web development, front-end development, cloud computing, big data, artificial intelligence, blockchain, and security. This blog aims to summarize the report in the most precise form possible to give readers a glimpse at the findings of the survey. Technology providers, technology dependent organizations, and research scholars will find this summary ideal for assessing the developers of China. Read on! Hangzhou is the New Developer Hotbed: China's developers are scattered all over the country; however, Beijing, Hangzhou, Shanghai, Shenzhen, and Guangzhou are the most densely populated developer regions. A point worth mentioning is that for the first time, a new city, Hangzhou, has popped up as a favorite, thanks to companies like Alibaba. Female Developers in China Remain Rare: China's developer population is still dominated by males, with only 7.9% of developers being female. This is a trend seen globally; the 2018 Stack Overflow Global Developer Survey revealed that only 6.9% of developers across the world are female (7.6% in 2017). On the brighter side, China leads the world in terms of the proportion of female population among all developers. Position and Monthly Income: Over 40% of developers in China are engineers and 32.2% of developers have a monthly income of 10,000 to 20,000 RMB ($1582 - $3165). Only 4% of developers will secure promotion to take up leadership roles at the organizational level. MySQL Dominates as the Choice of Database: An overwhelming 79% of developers use MySQL as their database. The survey revealed eight key technical features of development in China. Developers of China use these technological features very distinctly, as described below. When it comes to using web applications, China's developers are split between Discuz! and WordPress (34% and 33.4% respectively). 53.3% of developers have already deployed web applications on cloud servers. Traditional alternatives such as building computer rooms and renting servers are adopted less frequently. 58.8% of frontend developers believe that webpage building tools provide effective assistance to webpage building, especially the various kinds of dragging functions. A majority of developers prefer using mature third-party supporting solutions. The survey also revealed that 39% of developers claimed to have used Alibaba's frontend development frame. This reiterates the fact that Alibaba's frontend frame has established itself as a brand among frontend developers. According to the survey, 23.6% of companies are now generating 1-10T of data every day, and over 20% are creating more than 10T per day. Technical experts from Alibaba Cloud Developer Community also suggest that 1TB per day is the threshold of big data for organizations. Statement, profiling, and large-scaled structured storage are the major scenarios of Big Data service. Developers prefer using Hadoop and Spark as open-source technologies on Big Data due to their complete ecosystem and packaged solutions. As per the survey, developers usually start to work on AI from intelligent perception technology. Currently, computer vision, natural language processing, and voice technologies are the top three AI topics in China. In the field of computing vision technology, 70% of AI developers are primarily interested in object detection/division and image classification. Voice recognition is a very familiar AI technology for China's developers. However, they are still trapped by lack of computing capacity, tools, development capacities, and voice data. Among all available choices, React Native is undoubtedly the most popular cross-platform solution among developers. There are primarily two groups when choosing the IM protocol for APP among China's developers: the majority favor the private protocols, and the rest are adopting XMPP. The two groups represent two entirely different attitudes towards IM protocol. Furthermore, mobile developers who are optimistic about AR have also shown significant interest in AR developer tools. 40% of developers prefer ARPA SDKs as the ideal AR development tool while 19.5% of developers use ARLab SDKs. Before choosing a blockchain product, developers consider factors such as openness, availability, and convenience. The survey also established that Ethereum, Fabric, TrustQL, Corda, and BCOS as the top five blockchain products. When asked about the ideal number of nodes in consortium blockchain, 87% developers said that the number should be less than 100. 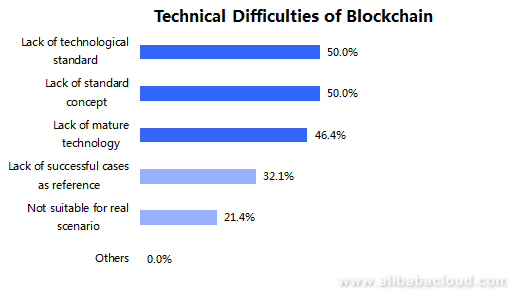 However, developers still have to face several technical challenges while working with blockchain. The graph below represents five primary technical difficulties of blockchain. 75.4% of security teams in China have less than 10 employees. The survey also disclosed the emergence of a unified platform to manage local and cloud resources. One can trace this trend to the emergence of cloud computing and complementary security management. Developers believe that it saves costs and enhances the efficiency of the security service. Therefore, unified security management platforms for cloud and local deployment would soon become an irreversible trend. Additionally, businesses have not accumulated much experience on cloud service implementation in China. The Alibaba Cloud Developer Community hopes to paint a precise picture of developers and the software industry in China with the China Developer Survey Report. The survey primarily focuses on the present situation of China's developers and divulges important statistics concerning eight major technical features of development in China. To learn more about the study, check out 25 Things You Should Know About Developers in China.